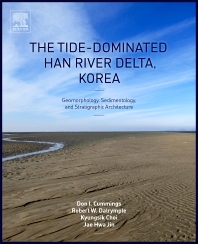 The Tide-Dominated Han River Delta provides a thorough analysis of a river delta in which tidal currents have reworked the river-borne sediment, generating characteristic geomorphological and sedimentological signatures in the process. Such "tide-dominated" deltas are common in the modern ocean, forming the substrate upon which entire populations are built. Furthermore, ancient examples contain enormous volumes of hydrocarbon. Despite this, tide-dominated deltas remain less well understood than their wave- and river-dominated counterparts, largely because processes within them are inherently more complex and fewer modern examples have been investigated in detail. This multi-year study by a team of experts in coastal geoscience represents the most complete documentation of a tide-dominated delta to date. Results help advance, and are applicable to, a broad range of fields within sedimentary geology, including clastic sedimentology, seismic and sequence stratigraphy, and coastal geomorphology, in addition to petroleum geology and reservoir engineering.